The waters of the Pacific are full of riches, and the favourable currents and nutrients makes for splendid bloom of colourful coral- making Fiji the soft coral capital of the world. Looking for a new destination to explore? Known for its luxurious private-islands, all-inclusive resorts, top spas, culinary destinations and outdoor adventures, Fiji is most widely celebrated for its culture, which uniquely welcomes visitors home. Fiji's white sand beaches and pristine, crystal-clear ocean waters offer an ideal vacation destination for divers, honeymooners and families-- or simply, those looking to relax and get away from it all. 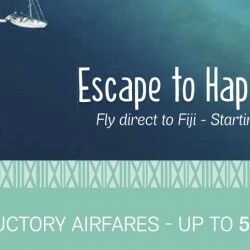 Fiji is now easily accessible thru Fiji Airways as they will be flying direct from Singapore starting 6 April 2016. Get up to 50% off their introductory airfares from now till 16 January 2016, with fares starting forom $839!